Since April 2016 will have been working in partnership with specialist contract catering company, Holroyd Howe. Holroyd Howe is a leading independent school caterer and the company brings a wealth of experience in delivering nutritious, creative food. As a strictly fresh food business, Holroyd Howe prides itself on sourcing the finest British ingredients, as locally as possible and approaches food with a no fuss attitude. Nothing processed, nothing added – just honest, delicious food every day. Placing a strong emphasis on the health and wellbeing of pupils, Holroyd Howe have introduced new menus designed to elevate nutritional standards across the board. Each day, the menu will include a wide variety of ingredients, cuisines and culinary styles, encouraging our pupils to try new things and enjoy a balanced diet. Please note that sometimes we have to amend our weekly menus at short notice due to restrictions on ingredients. Full of creative ideas, Holroyd Howe also run interactive food demonstrations and cookery classes for a fun, hands-on approach to food education. These include teaching pupils how to make fresh pasta or sushi, or creating colourful recipe cards that encourage them to try new types of food, and learn about seasonality and the variety of ingredients available. The friendly catering team are experienced in handling all dietary needs and allergies and are on hand to answer any questions you or your children might have. 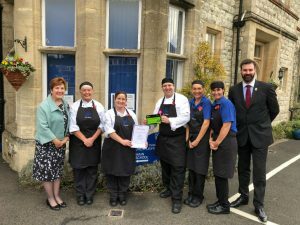 We know that it is important to you to know that we are providing the very highest standards of school food for your children and for this reason, we welcome you to visit us at the school to meet the Holroyd Howe team and our own chefs.